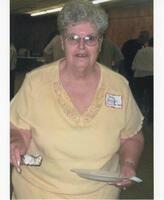 Provide comfort for the family of Betty Bourque with a meaningful gesture of sympathy. Crowley- A Liturgy of the Word Service will be celebrated for Betty Benoit Bourque, at 11:00 AM on Friday, March 22, 2019 in the Duhon Funeral Home-Crowley Chapel with Deacon Denis LaCroix officiating. Visitation will be held in the funeral home chapel on Thursday, March 21, 2019 from 4:00 PM until 9:00 PM with a Recitation of the Holy Rosary at 6:00 PM and will resume on Friday, March 22, 2019 at 8:00 AM until just prior to the service time. Interment will follow the chapel service and will be in Johnson-Hanks Cemetery in Morse, LA. Betty Benoit Bourque, 81 years old, formerly of Crowley, LA, residing in Lafayette, LA passed away peacefully on Tuesday, March 19, 2019 at 2:58 PM after struggling with internal complications. She was surrounded by her family at the time of her death. Betty was born July 30, 1937, at the family home. She was the oldest of seven children and was married to Ophelias “Joe” Bourque for over 25 years. Her hobbies included reading books, crocheting and playing bingo. She was preceded in death by her father, Dewey Benoit, mother Eustage Vincent Benoit, brother, Irvin Benoit and her youngest sister, Ella Benoit. Surviving relatives include her daughter, Yolanda “Kim” Bourque Palmer and son in law, Miles Palmer, former son-in-law, Kendall Mosing , only son Brendall Bourque; four grandchildren, Garrett Anthony Mosing, Danielle Mosing Ferrier, Vaughn Frederick Palmer and Troy Anthony Bourque; six great-grandchildren, Michael Comeaux, Jr., Alexis Comeaux, Kyson Lormand, Gabriel Ferrier, Aiden Bourque and Lexi Bourque. She will be remembered by her great-grandchildren by these sayings, “Why Thank You!”, “She’s so pretty” and “sha Lil boy”. She is also survived by four siblings, one sister, Barbara Benoit Girard and her husband, Bobby; brothers, Charles Benoit and his wife, Peggy, Daniel Benoit and his wife, Mona, Jimmy Benoit and his wife, Joyce and ex sister-in-law, Betty Joyce Benoit Homefield. Pallbearers will be her grandsons, Garrett Mosing, Troy Bourque, Vaughn Palmer; nephews, Dean Benoit, Terry Benoit and Michael Benoit. Honorary pallbearers will be Bobby Hebert and Jimmy Benoit, Jr. The family would like to extend our gratitude to all of the staff at University Medical Center/Lafayette General Health and Heart of Hospice for you attentiveness, care, compassion and kind words spoken through this difficult time.